I originally made this résumé for The Job I Want at Lululemon. Lululemon didn’t pan out (sigh) but, still—it’s pretty awesome. I know it’s pretty awesome, because every time I check it out again, I smile and then clap for myself. I mean, there are hidden gems everywhere in this thing. I would hire me. What do you think? 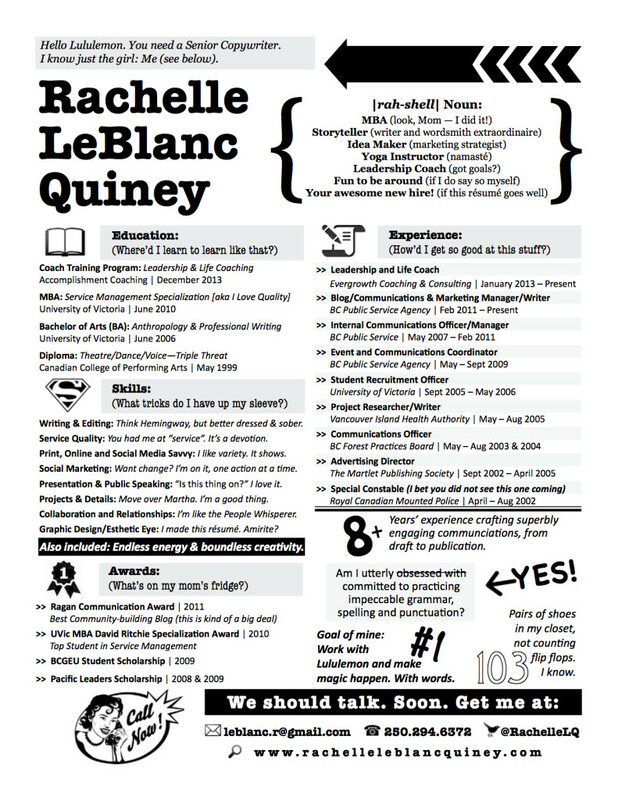 This resume, er “one-page infographic” is BRILLIANT! If Lululemon hasn’t hired you yet, I don’t know what they’re thinking! Although…their recent debacle with selling see-through yoga pants is perhaps an indication…I bet you could spin that story into a public relations triumph! If I was hiring and saw this cross my desk I’d call you up in a heartbeat for an interview right then and there. Thanks, Rebecca! They haven’t yet, despite all my best efforts thus far! I’ve met with them a few times, so it’s felt like it’s going somewhere: I’m not giving up yet!